UC Davis School of Law has launched an exciting new Water Justice Clinic designed to advocate for clean, healthy and adequate water supplies for all Californians. The new Clinic is a project of the Aoki Center for Critical Race and Nation Studies, in partnership with the California Environmental Law and Policy Center, and will offer unique environmental justice advocacy opportunities for King Hall students. Currently, over one million California residents lack access to clean, safe, and affordable drinking water. An overwhelming percentage of those residents live in rural California, and represent communities of color. The barriers to accessing clean water are not limited to environmental issues, and lack of access to water imposes a significant financial burden on low-income families, while also resulting in increased rates of obesity, shorter life expectancies and decreased learning outcomes for children. However, very few rural legal services attorneys are able to litigate water law cases, and no legal services attorneys offer transactional legal support to these California residents. King Hall's Water Justice Clinic seeks to fill that gap by identifying viable drinking water solutions and then implementing those solutions by providing transactional legal support to the affected low-income, rural communities. Prominent environmental justice expert Camille Pannu has been recruited to lead the Water Justice Clinic as its inaugural director. Pannu, a Berkeley Law alum, was passionate about environmental justice issues even as a law student. After law school, Pannu worked on environmental justice cases for the Center on Race, Poverty & the Environment as an Equal Justice Works Fellow in the San Joaquin Valley. Before coming to King Hall, she also clerked for District Judge Stefan Underhill in Connecticut and Ninth Circuit Court of Appeals Judge Richard Paez. The overarching goal of the new Clinic is to insure that all Californians have access to clean, affordable and safe drinking water, primarily by strengthening rural community water systems. The Clinic will also advocate for policies that fund needed improvements to those systems, address groundwater contamination, and ensure that rural voices are fully represented in future California water management decisions. Recent headlines about the drinking water scandal in Flint, Michigan and--closer to home--the water crisis faced by East Porterville residents in the southern San Joaquin Valley have prompted action by California legislators and voters to confront those problems directly. Proposition 1A on California's November 2014 ballot contained funding to provide assistance to California's disadvantaged communities, and King Hall's Water Justice Clinic is made possible by a three-year grant of Proposition 1A funds by the State Water Resources Control Board. Indeed, the Clinic is the primary legal services provider among the organizations funded by these Proposition 1A grants. Clinic Director Pannu reports that King Hall students will play a critical role in assisting these communities by enrolling in the clinical program each semester. There they will partner with grassroots community organizations such as the Community Water Center, while also obtaining classroom training from Pannu in water justice and related issues. Earlier this week, the U.S. Court of Appeals for the Ninth Circuit heard oral arguments in Flores v. Sesssions in which the U.S. government seeks an emergency stay in an action involving the 1997 Flores Settlement Agreement, which addressed the treatment of minors in custody of the Department of Homeland Security. The Flores litigation has been going on for years and this appears to be a last ditch attempt by the U.S. government to detain noncitizen minors -- which increased with the increase in Central American asylum-seekers in 2014. The panel that heard arguments were Judges Stephen Reinhardt, A. Wallace Tashima, and Martha Berzon. Law student Fabián Sánchez Coronado '18 attended the argument and wrote about the experience. From L-R: Michael Benassini '18, Holly Cooper '98 of the Immigration Law Clinic, Carlos R. Holguín of the Center for Human Rights and Constitutional Law, Eduardo Osorio '18, and Fabián Sánchez Coronado '18. On April 18, 2017, myself and other students from the Immigration Law Clinic and Civil Rights Clinic had the opportunity to attend Oral Argument at the Ninth Circuit Court of Appeals for Jenny Flores v. Jefferson Sessions, III, a case dealing with the rights of children in immigrant detention. The case arises out of a 20-year settlement agreement - the "Flores Settlement" - between plaintiffs and the government. At issue is Paragraph 24 of the Flores Settlement, which guarantees minors in detention the right to a bond redetermination hearing. Last summer, the Immigration Law Clinic's Co-Director, Holly S. Cooper '98, teamed up with Carlos R. Holguín, General Counsel at the Center for Human Rights and Constitutional Law, to bring an enforcement action in federal court after the government refused to comply with its duties under the settlement, thereby denying detained children basic due process. On January 20 of this year, Judge Dolly M. Gee of the U.S. District Court for the Central District of California granted the motion to enforce the settlement. Weeks later, the government filed an emergency motion in the Ninth Circuit to stay the District Court's order, paving the way for a renewed fight over the rights of children in immigrant detention. After the Ninth Circuit granted the stay and expedited briefing, a group of us from the Immigration Law Clinic and the Civil Rights Clinic rolled up our sleeves and got to work, helping Professor Cooper and Carlos Holguín prepare the case. Wesley Cheung '18, Eduardo Osorio '18, Michael Benassini '18 and I helped ready the Plaintiffs' brief and prepare the materials for Oral Argument. 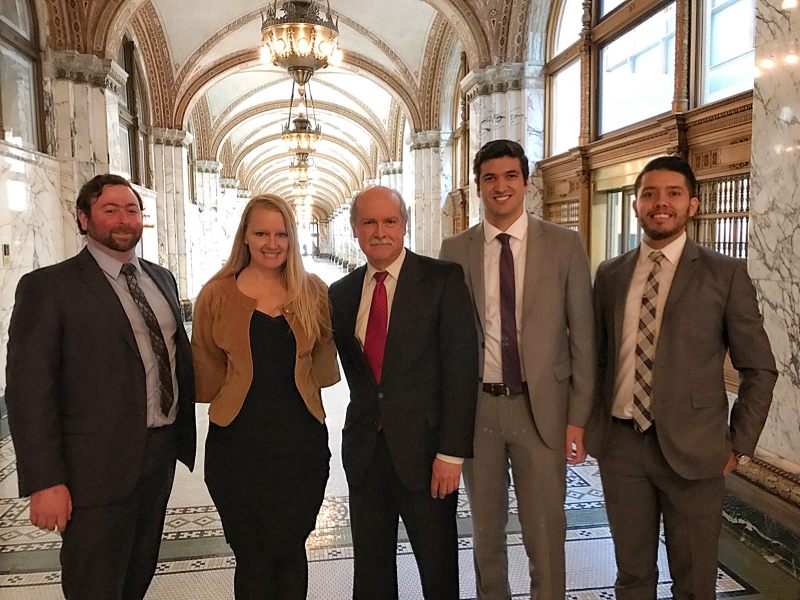 The experience of working on an appellate brief - and attending oral argument at the Ninth Circuit - was a highlight for me, as I'm sure it was for my fellow law students. After spending the academic year working on various immigration and civil rights cases with our respective clinics, it was great to sit at counsel's table for this particular occasion. Earlier this week, I testified before the California Assembly Higher Education Committee on April 18 in support of Assembly Bill 856, which seeks to diversity faculty and athletic coaches at California universities. These were my remarks. Thank you, Chair and Members. My name is Rose Cuison Villazor and I am a Professor of Law at UC Davis. I have been a law professor for eleven years and I have been teaching at UC Davis for five years. As the only Filipino American law professor in a public university and, indeed, the entire state of California, I come before you today in support of AB 856, which would increase faculty diversity at California public Universities and Colleges. I have seen first hand the need to increase diversity amongst faculty at California schools. According to the Association of American Colleges and Universities, "Faculty, along with staff, serve as an institution's front-line representatives, and in the academic realm, faculty are also the embodiment of authority on campus. Having a diverse faculty ensures that students see people of color in roles of authority and as role models or mentors. Faculty of color are also more likely than other faculty to include content related to diversity in their curricula and to utilize active learning and student-centered teaching techniques." A diverse faculty helps close achievement gaps, improves campus climate, and creates new curriculum and research. Having a faculty reflect the student population benefits students' growth and has a positive impact on their learning experience. Currently, in states where affirmative action has been banned, including California, universities have introduced new admissions and financial aid strategies based on socioeconomic status. Similar initiatives can be applied to the hiring process at California schools. I thank the author for bringing this measure forward and respectfully ask for your AYE vote. As court systems throughout the country struggle to deliver civil justice in the face of major budget cuts, a new study by a University of California, Davis, law professor finds that fewer than one-third of people with cases filed in state court even know about their court's mediation and arbitration programs. In recent years, state courts have been overburdened with litigants seeking civil justice in a system still recovering from the economic downturn. In many cases, alternative dispute resolution procedures such as mediation and nonbinding arbitration can provide litigants with relief from the expense and waiting time associated with trial. However, such procedures provide little opportunity for justice to litigants who are unaware of their existence. Over 330 litigants from three state courts were asked in a phone survey, after their cases ended, whether their court offered mediation or arbitration. All study participants had cases that were eligible for both procedures through their court. "The findings from this study raise serious questions about whether plaintiffs and defendants understand what procedures are available to them, and how meaningfully they participate in decisions about how to handle their legal conflicts," said Donna Shestowsky, a UC Davis professor of law who is the report's author. The study, forthcoming in Harvard Negotiation Law Review, found that only 24 percent of litigants correctly reported that their court sponsored mediation, and only 27 percent correctly stated that their court offered arbitration. Even worse, represented litigants were not significantly more likely to know about their court's procedures than were those who handled their case without a lawyer. Litigants who knew their court offered mediation had more favorable views of their court, but a similar result did not emerge for arbitration. The study also found that when litigants correctly identified their court as offering arbitration, they were more than twice as likely to consider using arbitration for their case. "The study suggests that courts should invest resources to ensure that litigants know about their procedures. By making these efforts, litigants might be more apt to consider using the programs in which the courts have already invested, and give courts the credit they deserve," said Shestowsky. Shestowsky's project is the first known multijurisdictional study to explore how civil litigants assess procedures at various points of time during the same lawsuit. The article, "When Ignorance Is Not Bliss: An Empirical Study of Litigants' Awareness of Court-Sponsored Alternative Dispute Resolution Programs," is forthcoming in volume 22 (spring 2017) of the Harvard Negotiation Law Review. The study was funded by grants from the National Science Foundation, the American Bar Association Section on Litigation, the Norm Brand '75 & Nancy Spero ADR Research Fund, and UC Davis. Last weekend brought one of the most-anticipated student events of the academic year: Aokirama (formely Cardozorama), the law school talent show! Check them out here on YouTube! Popular legal blog Above the Law took notice, soliciting submissions for its annual video contest by writing, "Hey law students - if your professors can do it, so can you!" On Friday, April 7th, I had the opportunity to lead my King Hall Ocean and Coastal Law students on a field trip to the UC Davis Marine Biology Laboratory in Bodega Bay, California. The Lab, founded by the University of California a half-century ago, is the site of pioneering marine science research by UC Davis faculty and graduate students who work at the Lab. 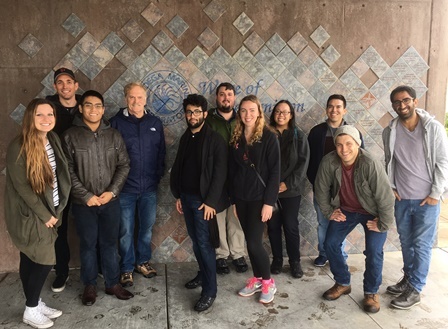 During our visit, my law students received an overview of the Lab's history and operations from UCD Professor and Marine Lab Director Gary Cherr. We also heard substantive briefings from two post-graduate UCD researchers, who shared the status and findings of their marine science projects. Director Cherr provided our group with an extensive tour of the Lab and surrounding area, which are part of a UC-owned marine reserve located on a spectacular peninsula extending into the Pacific Ocean on the Sonoma County coast. Last week's field trip afforded our law students first-hand exposure to the marine science research that serves as much of the foundation of Ocean law and policy that they've been studying this semester at King Hall. Additionally, it provides our students with invaluable exposure to scientists: learning to work effectively with experts from a variety of disciplines is essential to a successful environmental law practice--and an essential part of King Hall students' legal education.